Primary sources are not limited to just print, so when working with a primary source, remember that there are many types of primary sources. Technology has made all of mediums available with the click of a mouse! Some primary sources are published documents. They were created for large audiences and were distributed widely. Published documents include books, magazines, newspapers, government documents, non-government reports, and literature of all kinds, advertisements, maps, pamphlets, posters, laws, and court decisions. When you look at published documents, remember that just because something was published does not necessarily make it the truth, the whole truth and nothing but the truth! Keep in mind that behind each document you read, there is an author, and every author has their own point of view. That being said, even an opinionated source can tell us important things about the past. Fortunately for us, many unpublished documents have been saved, and can be used as primary sources. Have you ever kept a journal or a diary? Unpublished documents include these along with personal letters, wills, deeds and even your family Bibles that contain family histories. Years from now someone may look at your school report card to find out what kind of student you were. Report Cards are unpublished primary documents. Here is more to think about when you are doing some research. Unpublished documents often come from community organizations, churches, service clubs or any other type of club. Court records, such as a marriage license, sale of property, tax records and much more give you another variety of unpublished records. Oral traditions and oral histories provide another way to learn about the past from people with firsthand knowledge of historical events. Oral histories are as old as human beings. Before people could write, the only way to pass down information was through speech! Many people around the world still use oral traditions to pass along their knowledge. Don't forget that an oral history could also be listening to a speech! Don't forget Visual documents! Have you ever heard the saying, "A picture tells a thousand words"? Pictures tell us a lot about the past. These documents can include photographs, films, paintings, and other types of artwork. These are snapshots of the past. Look at any picture or painting and you can see fashion, architecture, culture, customs, work and play. Remember though, like other primary source documents, a visual document has a creator with a point of view. Even the most magnificent picture or photograph was created by someone using film, cameras, paint and canvas to create a certain look. Primary sources expose students to different points of view on issues from the past and present. Interpretations of the past are constantly discussed and debated. By working with primary sources, students can become informed and join in the debate! You will be taking a tour through the National Archives Website and take a look at the many primary sources available. Students will look go to Online Exhibits and look through Elvis with Nixon. 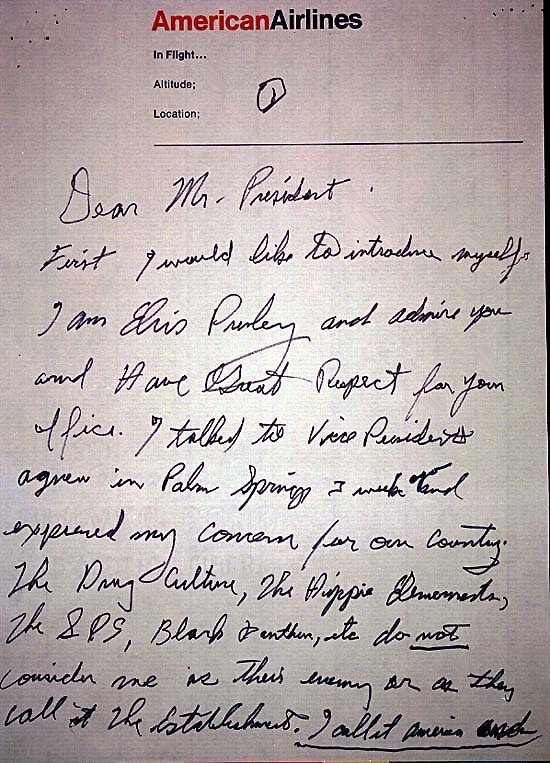 Together look through the pictures and read Elvis's letter to President Nixon. After students have seen the images and letters, they will browse through some of the other online exhibits as time allows. Photographs of endangered animals, astronomical phenomena, and depression-era workers are just some of the resources available from this comprehensive site.